The Eastern and Southern Africa Region (ESA) includes about half of the population in sub-Saharan Africa, and fertility levels remain high, particularly in East African countries. Child and maternal mortality rates in the region came down in the Millennium Development Goal (MDG) era, but a substantial challenge remains in all ESA countries, and achieving the Sustainable Development Goal (SDG) targets are within reach only if robust evidence drives the implementation of appropriate, effective and efficient interventions, and responds to complementary challenges related to adolescent sexual and reproductive health, equity in access to quality health services and gender equality. This includes, but is not limited to, past fertility trends that have resulted in a large cohort of adolescents in need of services. enhancing the capacity of country and regional institutions to conduct RMNCAH and nutrition related analyses and research and effectively communicate the findings to policy makers. The initial aim is to establish a three-year initiative in partnership with national and regional institutions to conduct multi-country studies on RMNCAH & nutrition that generate evidence for policymaking and programs at the national, regional and global levels. The project will incorporate a strong capacity strengthening component and lead to the creation of a regional network of institutions linked with the Countdown to 2030 initiative. The centerpiece for 2017-2020 are three year-long rounds of analysis, evidence generation and communication with country and global institutions. The prototype for a round of analysis and communication is described in Figure 1. The analysis component uses data from household surveys (e.g. to assess the implementation status of the continuum of care and equity in the coverage of interventions), health facilities (DHIS2, facility assessments), and administrative data sources (workforce, financing etc.). Operational research data is integrated into the analysis, particularly to explain why certain changes happen or do not happen. As with other Countdown research and analysis, the focus is on coverage and equity, but with considerable attention for drivers of change. Subnational analysis is prioritized where possible and relevant. The first workshop was held in Nairobi, Kenya from November 27-December 1, 2017. 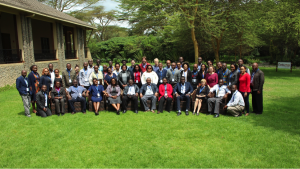 The Countdown to 2030 regional network for Eastern and Southern Africa, led by the Africa Population Health Research Centre (APHRC), conducted its second analysis workshop in Naivasha, Kenya, July 9-13, 2018. The 38 analysts from the Ministry of Health and national public health institutions in 17 countries focused on the inequalities in the continuum of care for reproductive, maternal, newborn and child health, facilitated by a team from APHRC, Johns Hopkins University, University of Pelotas, University of Manitoba, WHO and UNICEF. The first workshop (November 2017) focused on the analysis of individual (with Stata) and aggregate data (extracted from StatCompiler and analysed in Excel and HEATPlus). The participants produced basic tabulations and graphics on inequalities in RMNCH. In the subsequent months the country teams conducted further analyses and compiled data on health system and services in their home countries. The second workshop brought together all data and analyses for their countries and for the region. Tools for analysis of survey data, annotated graphs and rich discussions on interpretation of the results furthered the analytical capacities and generated evidence for decision-making. The participants produced and interpreted visualizations of levels and trends in inequalities in coverage and child mortality their countries in the region, including new insights into differences between the rich and the poor, subnational health system performance and urban progress. The network is continuing to work on regional publications on these subjects and planning further analysis meetings on the generation of health statistics from health facility data and other topics. The Countdown to 2030 regional initiative for Eastern and Southern Africa, led by the African Population Health Research Center (APHRC), teamed up with WHO and UNICEF to conduct its 3rd analysis workshop in Naivasha, Kenya, November 27-30, 2018. The focus was on health facility data analysis for intervention coverage indicators and mortality/morbidity statistics for universal health coverage. Seventeen countries nominated 50 participants – senior analysts from Ministry of Health, public health institutions and Universities – and brought their own district and national data sets for in-depth analysis using new tools and approaches. The lessons learned will be reflected in a WHO set of guidance documents on analysis and use of health facility data. After two successful analysis workshops organized in November 2017 and July 2018 that brought together government officials and academics from ESA countries, APHRC has supported the dissemination and knowledge translation of the evidence generated further to the analysis workshops. In Uganda, APHRC supported the implementation of in-country dissemination activities targeting relevant audiences, through a collaborative with the Makerere University School of Public (MakSPH).